As many of you know, I got engaged a few weeks ago. 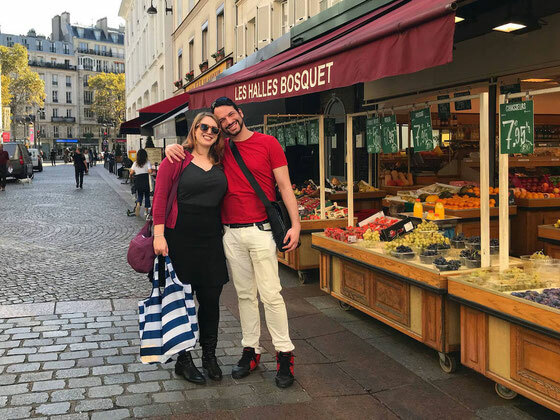 So I'm going to tell you the story of how my fiancé, Lawrence, proposed! 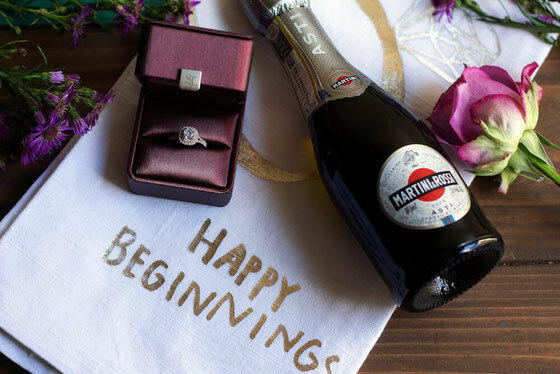 How did he pop the question and pull off a surprise engagement? 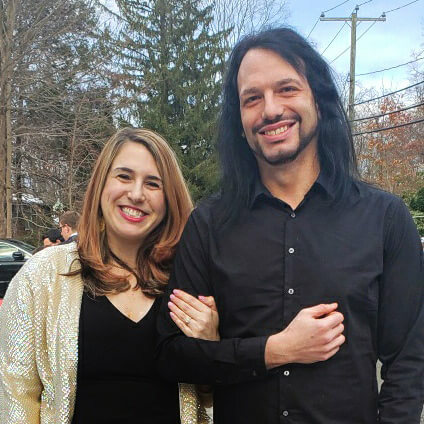 Here are all the details of how he asked, how I said "yes," and why I can't wait to say "I do." 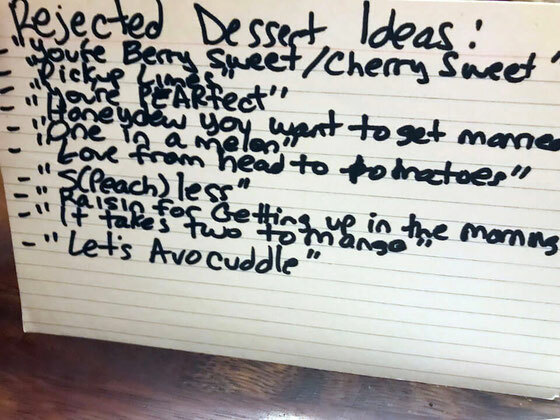 A few weeks ago, I had just come home from a business trip, and Lawrence told me that he'd made dessert. He said he'd done lots of cooking because he was bored while I was away. I'm thinking he told me this because it's not like him to make dessert. We try to avoid keeping too many sweets in the house! 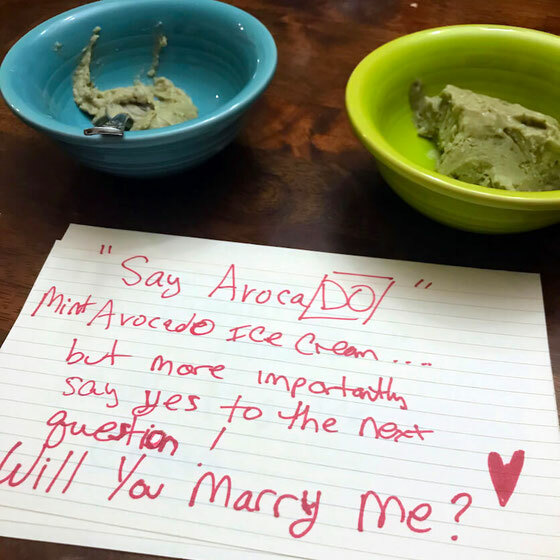 But Lawrence knows that the way to my heart is through food and so a sweet proposal would be perfect for us. He also knew that I wanted a private proposal with no one else around. Lawrence asked me to go to the bedroom for a few minutes while he defrosted dessert. 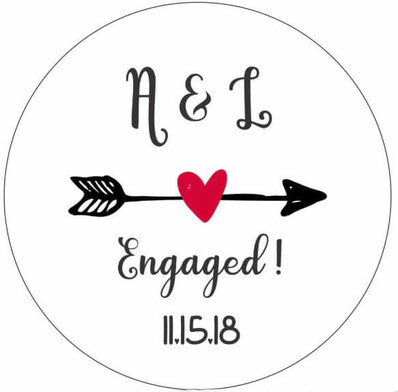 I didn't think much of it until he called me out to the dining room, and there were eight mini bowls of ice cream and nice creams on the table. He'd made four varieties from scratch, each with a romantic food pun title! 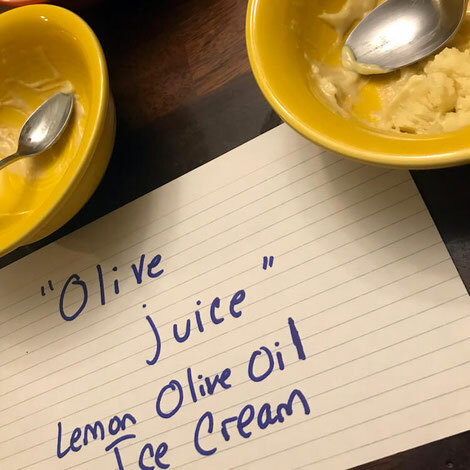 The first flavor that Lawrence had us taste was a lemon olive oil ice cream called "Olive Juice." This is a play on the words "I love you" and an inside joke from our early years of dating. Here's The New York Times recipe he used as inspo. One of my favorite foods in the world is passion fruit. I grew to love the fruit on a trip to the Dominican Republic years ago. It's plentiful there but somewhat difficult to find in the northeast. One of the ways Lawrence won me over when we'd newly started dating was by surprising me with a passion fruit one afternoon. 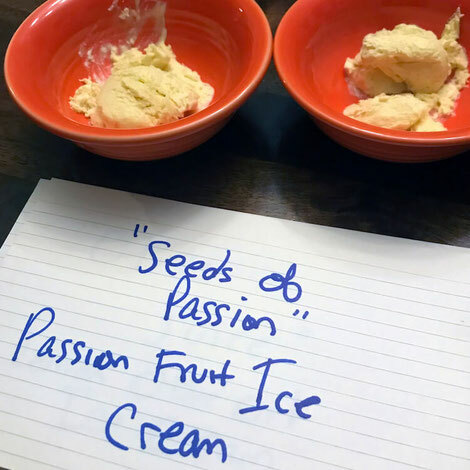 He called this ice cream flavor "Seeds of Passion" and followed this recipe from Olivia's Cuisine. I also love figs. They're in season for such a short time each year, and I always run to get my hands on some. And of course, I enjoy dried figs year round! 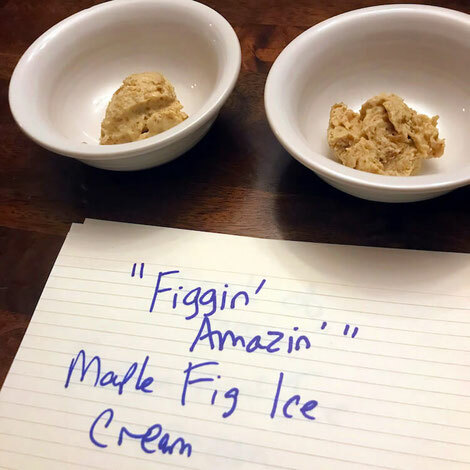 The third variety of ice cream Lawrence served us was a maple fig ice cream called "Figgin' Amazin'" (made by following this Food Network recipe). Lawrence later told me that he'd wanted to call it "You're Figgin' Amazin'" but didn't want me to make the titles overly sweet, or I might guess that he was about to propose to me! Then came the last variety of nice cream, this one with a base of avocado, mint, and pine nuts! He used this recipe from Feel Good Foodie as inspo. Lawrence named this variety "Say AvocaDO." Before I knew it, Lawrence was on his knee, with one of my favorite songs (a Scottish rendition of Rod Stewart's "Rhythm of My Heart") playing. 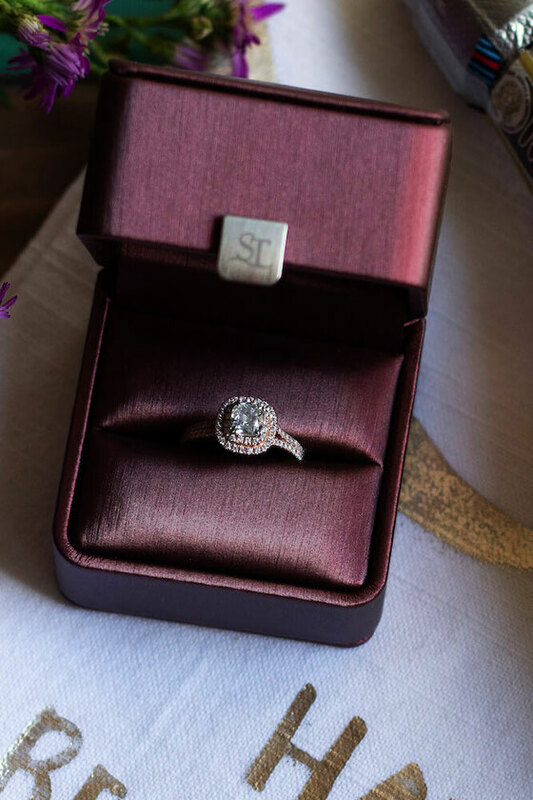 He opened a ring box containing the most beautiful rose gold Henri Daussi halo cushion-cut engagement ring. Then he asked me to marry him! Of course, I immediately said yes! Because, you know, I can't wait to marry this man! Side note: Lawrence went to great lengths to keep the proposal a surprise! He even bought a hand mixer for the ice cream prep. He wasn't sure if we have one (we do!) and didn't want to ask me in case that would have given anything away. One of the things I love most about Lawrence is his sense of humor. He's always making me laugh. 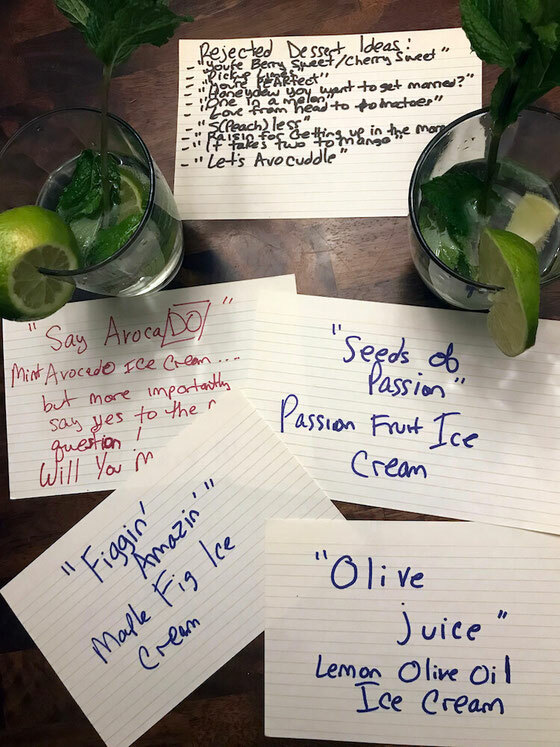 He knew we might be a bit teary after the proposal, so he whipped out this notecard with reject ice cream titles. 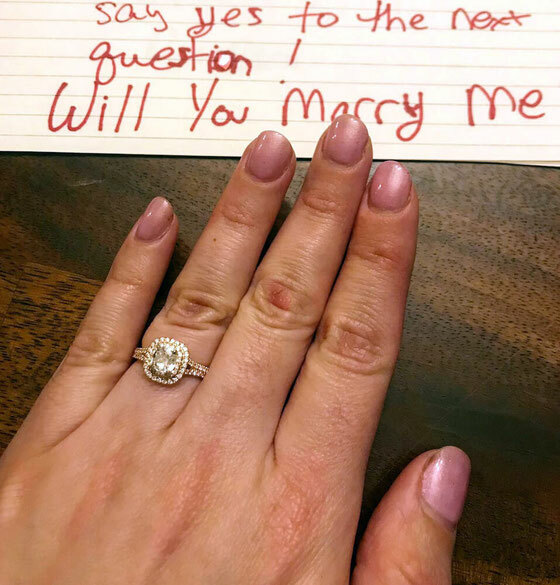 We did laugh, right after his sweet proposal! Then Lawrence made our favorite cocktail, gin and tonic. We discovered our love for the drink on a trip to Scotland, and we now make it with Hendrick's gin and Fever Tree Elderflower Tonic Water.